One of the things which allures the unsuspecting to the Catholic Church is it’s claim to authority. In a world of constant change and sinfulness, one full of strife and discord, Rome’s claims can look very much like a safe harbor. So the emotional appeal that lures the unaware is understandable. However one must go beyond emotions and look at the claims themselves to see that they are, in a word, vacuous. Worse still, Rome’s authority actually hinders honest scholarship, damages the relationship between clergy and laity and actually undermines the sacraments. So it was with great interest that I found a compilation of twelve articles by Catholic scholars that makes this case in spades.1 The anthology is edited by noted historians Michael J. Lacey and Francis Oakley and includes contributions by Catholic professors from the Louvain, Catholic University of America and Notre Dame, Catholic priests, nuns and canon lawyers and others with like specialties. They show with great aptitude how Roman authority has created a “crisis” for the modern Catholic church. In the period ahead I would like to share with you several of these articles that I have found fascinating. The next will be a look at how the history of the church makes it impossible to identify what truly is the nature and justification for Rome’s claims to power. …and increasingly irrelevant to local Catholics. That is to say, today’s Roman Catholics cannot be bullied by Rome the way Catholics have been in the past.4 Or said still another way is that Rome has none of the actual authority that it claims. “Pretend” authority aptly describes the extant environment for Roman Catholics. There is no better example of this than Rome’s “authoritative” teaching on birth control and contraception. The unwarranted claim that Rome makes in its current teaching is rejected by the majority of Catholics for several good reasons. The first is that incontrovertibly contradicts earlier church teaching and actually permits what was previously – and “authoritatively” – proscribed as sinful! Later in this volume we will hear from a professor at Roman Catholicism’s oldest university – the Louvain – explain how the meaning of the term “Magisterium” – which signifies the teaching authority of the Roman church – has devolved into whatever the current Magisterium says it is. I am very excited to be sharing this work with you. It is obvious to any honest observer that the official Roman claims to authority over the Catholic church are merely a power grab and a charade. The fact that innocent people are still, today, swayed by them is all the more reason to bring the discussion into the open. This fabrication deserves to be exposed and these Catholic writers have begun the work brilliantly. Next we will begin with an old problem for Rome’s claims to authority – the Council of Constance. 1 Lacey, Michael J. and Francis Oakley, ed. 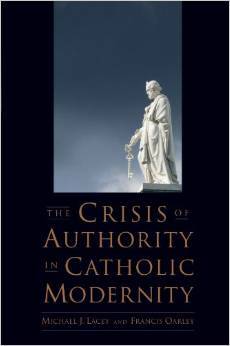 The Crisis of Authority in Catholic Modernity. New York: Oxford University Press, 2011. 4The example of the mistreatment of John Courtney Murray, S.J as recently as the 1960’s is but one example.